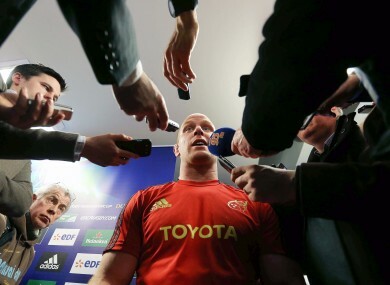 Munster's captain Paul O'Connell at the post match press conference last weekend. We could have picked half a dozen piece on Thatcher and her relationship with football in England, but John Brewin on ESPN sums it up very nicely indeed. TheGainLineBlog breaks down Declan Kidney’s tenure as Ireland boss in this comprehensive post. Louisiana’s Kevin Ware was the man of the moment as he cut down the nets after the big game on Monday night. But in the other dressingroom, this was happening. Grantland’s Shane Ryan on the pain of losing well. The Guardian’s Jonathan Wilson on the relationship between tactics and players. Deep. “But now as Shorter and his teammates Kenny Moore and Jack Bacheler wondered what would happen to their event—the marathon—the politicians debated whether to let the Olympics continue. Israeli Prime Minister Golda Meir called for the games’ cancellation, as did influentialNew York Times sports columnist Red Smith. At the opposite extreme, Arab nations boycotted the memorial ceremony for the slain athletes. Letting the games continue seemed disrespectful and futile. How could running give meaning to murder? And yet not to run seemed equally meaningless. Nothing would bring back the dead. Deadspin have a long extract from Kings of the Road: How Frank Shorter, Bill Rodgers and Alberto Salazar Made Running Go Boom by Houghton Mifflin Harcourt. Email “Deccie's legacy, the losing locker-room and terrorists at the Olympics: some of the week’s best sportswriting”. Feedback on “Deccie's legacy, the losing locker-room and terrorists at the Olympics: some of the week’s best sportswriting”.